PanARMENIAN.Net - The Armenian Museum of America (AMA) will host March 12 the opening of a touring exhibition displaying the works of Yenovk Der Hagopian entitled, “Untold Story of an Armenian-American Artist,” the Armenian Weekly reports. The “Untold Story” exhibition will display more than 20 works, including paintings on canvas, metal engravings, woodcarvings, and an album. The global tour of the exhibition was launched in Brooklyn, N.Y., by the Bishop Gallery and the estate of the late artist. In addition to its second stop at AMA, the tour will also travel to Los Angeles, Washington, D.C., Miami, and Toronto, with a conclusion in Paris. The exhibition will be on display at AMA until May 24, Der Hagopian’s 116th birthday. Der Hagopian’s work, which serves as a history lesson on Armenian culture, will be displayed for all to see 50 years after his death thanks to Bishop Gallery owners Erwin John and Stevenson Dunn. AMA is no stranger to Der Hagopian’s work, the Armenian Weekly says. 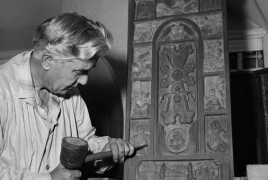 Before his death in 1966, he constructed seven large wooden replicas of ancient Armenian churches, each several feet high. These were to be a part of a larger installation on a four-acre parcel of land he bought in Connecticut. However, Der Hagopian suffered a heart attack a week before they were to be moved and the seventh church, a model of the Cathedral of the Holy Cross, was never finished. The churches have been displayed in an exhibition at the AMA and are currently part of the museum collections. Born on May 24, 1900, in Ishkhanikom, Western Armenia, Yenovk Der Hagopian was the son of an ordained priest and lifelong confidante to the famed “Father of Abstract Expressionism,” Arshile Gorky. Der Hagopian was said to have created his pieces of Armenia in their exactness from memory, and even recreated an Armenian landscape, complete with lakes and mountains, in his own backyard. He immigrated to Massachusetts in 1923 to live in Watertown, where he reunited with Gorky and continued his art studies. It was also in America that he recorded Armenian folk songs and started a family. He married Nevart Kalarchian on Aug. 28, 1948. His artwork was discovered by his wife’s granddaughter, after her family decided to renovate their home. She was intrigued by the musings held in storage for decades, and decided to explore the life of this artist.